1942 Australian propaganda poster. Australia feared invasion by Imperial Japan following the Fall of Singapore. 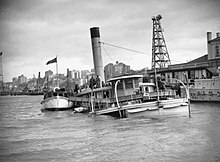 HMAS Kuttabul, sunk by a Japanese midget submarine attack on Sydney Harbour, 1942. ^ Martin, A.W. (2000). "Menzies, Sir Robert Gordon (Bob) (1894–1978)". Australian Dictionary of Biography. Volume 15. Carlton, Victoria: Melbourne University Press. pp. 354–361. ISBN 9780522844597. ^ a b c d "In office - Robert Menzies". Australia's Prime Ministers. National Archives of Australia. Archived from the original on 13 November 2013. Retrieved 28 July 2016. ^ "Wartime internment camps in Australia". National Archives of Australia. Retrieved 28 July 2016. ^ a b "Before office - John Curtin". Australia's Prime Ministers. National Archives of Australia. Retrieved 28 July 2016. ^ a b c d "In office - John Curtin". Australia's Prime Ministers. National Archives of Australia. Retrieved 28 July 2016. ^ "Midget Submarines history at". Home.st.net.au. Archived from the original on 13 April 2010. Retrieved 29 April 2010. 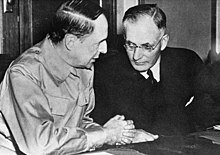 ^ "Elections - John Curtin". Australia's Prime Ministers. National Archives of Australia. Retrieved 28 July 2016. ^ Cunneen, Chris (1996). "Gloucester, first Duke of (1900–1974)". Australian Dictionary of Biography. Volume 14. Carlton, Victoria: Melbourne University Press. ISBN 9780522847178. ^ "Francis Forde". Australia's Prime Ministers. National Archives of Australia. Retrieved 28 July 2016. ^ Waterson, D. B. (1993). "Chifley, Joseph Benedict (Ben) (1885–1951)". Australian Dictionary of Biography. Volume 13. Carlton, Victoria: Melbourne University Press. ISBN 9780522845129. ^ "John Curtin". Australia's Prime Ministers. National Archives of Australia. Archived from the original on 26 July 2010. Retrieved 29 June 2010. ^ [ "Air raids on the Australian mainland". Australian War Memorial. Retrieved 27 July 2016. ^ Beaumont (2001), p 321. ^ Beaumont (2001), p 453. Adam-Smith, Patsy (1984). Australian Women at War. Melbourne: Thomas Nelson Australia. ISBN 0-17-006408-5. Butlin, S.J. (1955). War Economy, 1939–1942. Australia in the War of 1939–1945. Series 4 – Civil. Canberra: Australian War Memorial. Butlin, S.J. ; Schedvin, C.B. (1977). War Economy, 1942–1945. Australia in the War of 1939–1945. Series 4 – Civil. Canberra: Australian War Memorial. ISBN 0-642-99406-4. Hasluck, Paul (1952). The Government and the People 1939–1941. Australia in the War of 1939–1945. Series 4 – Civil. Canberra: Australian War Memorial. Hasluck, Paul (1970). The Government and the People 1942–1945. Australia in the War of 1939–1945. Series 4 – Civil. Canberra: Australian War Memorial. ISBN 978-0-642-99367-0. McKernan, Michael (1983). All in! Australia During the Second World War. Melbourne: Thomas Nelson Australia. ISBN 0-17-005946-4. McKernan, Michael (2006). The Strength of a Nation. Six years of Australians fighting for the nation and defending the homeland during WWII. Sydney: Allen & Unwin. ISBN 978-1-74114-714-8. This page was last edited on 11 March 2019, at 07:59 (UTC).